Stimulate interest in all art forms! Promote schools, exhibitions, performances and productions of artistic and cultural value to the residents of the Corry area. Bring artistic and cultural activities to Corry for the enjoyment and enlightenment of its residents. Patron: Patrons are individuals interested in fostering and supporting the objectives of the Council. Patron dues are $25 for an individual / $50 for a couple. Corporate Sponsors: Sponsors are businesses or recognized groups in the community interested in the objectives of the Council. Financial support is at the discretion of the Sponsor, but no less than the maximum Patron dues. Your membership guarantees that you pay only for your meal at dinner theatre. Your membership helps bring family oriented, culturally enriching events to our area. Your membership helps bring residents of the Corry area closer together as a community. 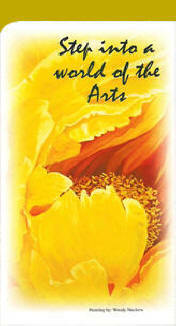 Membership in the Arts Council also makes a wonderful gift! Or, you may download this PDF (73K) version of our brochure and application form.